A recent photo on your site showed Arnold Maley with others standing in front of the bell wagon. Several years ago I tried to find out just when and where he died. I ran up against a stone wall. Our local CFA tent is named for him and Dub Duggan. Maybe one of your site visitors can provide the answer. Blankart posted on your 1/28/07 blog, I tried answering inquiries by P.
Fame Awards TV Special being filmed & produced by America's Joe Cates. I was there as part of the Cates team & witnessed the entire cage mayhem. '69 for the TV special. engagement, produced by Kenneth Feld, for Disneyland, California. in early March to rejoin Carson & Barnes for a new season. Here are a few more photo's from the UK of years gone by. 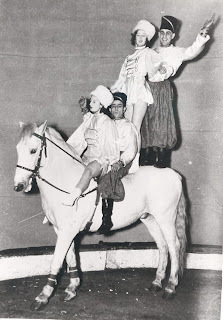 During the winter months G.B Chapman ran a Stage Circus and at one time some of the Fossetts were also there, My Dad, Freddy Yelding and brother Victor Julian did a voltage act with two of the Fossett sisters, Margaret & Emmie. Margaret later married one of Dad's brothers and today she is still alive and well and will be 92 years old in June. 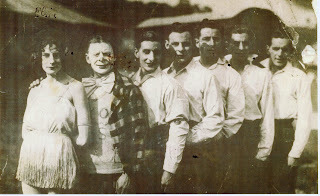 One picture of six of the Yelding brothers and sister Dolly. 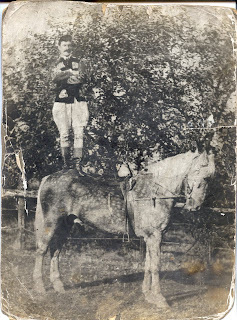 I couldn't resist in enclosing two of the Cowboy act that I did with my mother & father in 1956. Hope these will be of some interest to your readers, especially in the UK. Texas Slim Collins and Montana Nell. 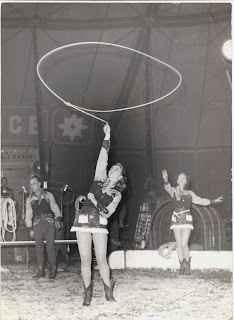 With the James M. Cole Circus in 1942. Rudy Bros. Circus, Monrovia, Calif. Oct.3, 1959.....Bill Woodcock with Anna May, Lydia and Sadie. The "Recent Comments" normally seen in the left column have vanished and taken with it all the eMail I have received for the past ten days. Shannon says he can return "Recent Comments" but the EMails are gone forever. Included were Lori Gilbert's comments regarding today's blog which I had to go without, a picture of Rex Williams with that damned attack parakeet "Buzzard" that used to jump off his hat, run down his arm and bite people, and another set of family pictures from Sue Lenz and I might add several of Ms Lenz in a Western number had her appearing not unlike a Dallas Cowboys Cheerleader. 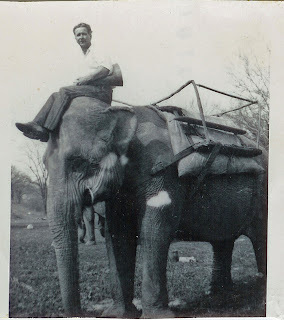 This is Ms Gilbert's grandfather Sam LeFleur, many years with the Robinson Military Elephants as well as the Cincinnati Zoo. In the background it looks like the elephant barn at the Robinson facility in Terrance Park. This is the back side of the picture I sent you last Friday. It appears my father was having trouble spelling your grandfather's last name. Mr. Thompson was always called "Red Cap" would the nick name "Cactus" apply to Mr. LeFleur? This 1931 picture of your grandfather might be with St. Leon Circus but the square center poles in the tent looks more like something that would be put up in a Fairgrounds infield. This picture identified as John Robinson Circus. 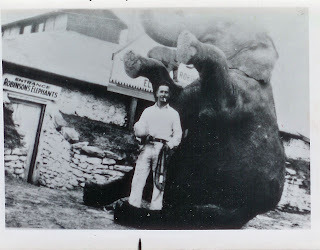 The final version of the Robinson Show closed after the 1930 season and I doubt that they had an elephant ride. I think this is probably the Cincinnati Zoo. 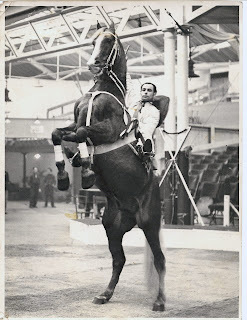 No idea who the gentleman with Mr. LeFleur might be but the mention of Luna Park is interesting. Possibly the Robinson elephants were booked in there for the summer. 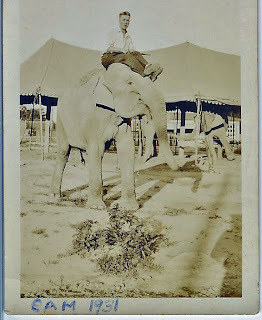 When the Robinson Family sold their circus they retained four elephants that appeared in Vaudeville for many years. Here is one such date in 1914 and shows "Tillie" doing the "walk-across" with her trainer Dan "Curley" Noonan. "Tillie" first appeared with the John Robinson Circus in 1872. Another early picture with Noonan seated at left on "Tillie". The show is unknown to me. This picture taken at a Shrine Date, might include your grandfather. 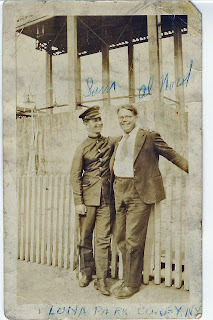 This could be in Cincinnati, I can't make out the Temple's name on the fez. 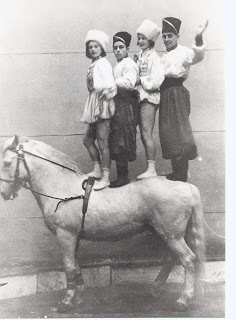 For some reason we see famous Equestrian Director Fred Bradna posing at left. After the death of "Tillie" in 1932, the act continued with three elephants. I remember Mr. Thompson well, he was a very nice man. The nickname came when joining a circus as a canvasman, his most outstanding feature was the cap he was wearing. This was the last time I ever saw Mr. Thompson. It was at the Ringling Park in 1977 and includes Harold Ronk, Trevor Bale, unknown, Barbara, Arnold Maley, "Red Cap" and Bob Harrison. In front is my daughter Dalilah who incidently just completed her 10th year with Verizon. This happened a year or so before we joined the Cole Show and was still a topic of conversation. "Pitt" was imported by the John Robinson Circus in 1900 and was quite small so I would estimate her age to be 46 or 47 at the time of death. The information on the plaque was probably supplied by someone in the Press Department. The most common question I have received over the years is, "How long do elephants live?" and upon receiving an honest answer, the inquiring party was always disappointed. Consequently, after seeing this picture and continuing to this very day, I always reply "102" and the conversation ends happily. 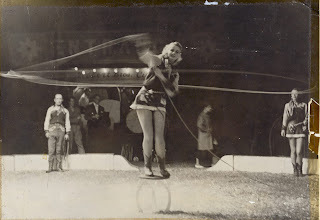 This circus was owned by Ray Rogers and operated out of York, South Carolina. We joined the show in 1937 when I was 2 years old and we remained thru 1942. When the title was changed to Wallace Bros. has always been confusing to me. I have heard that the change came about in 1936, the year Sam Gumpertz left Hagenbeck-Wallace in the barn but some of these pictures dispute this.